A steampunk-ish fantasy adventure with precious books at the center and librarian and her dragon sidekick at its helm. 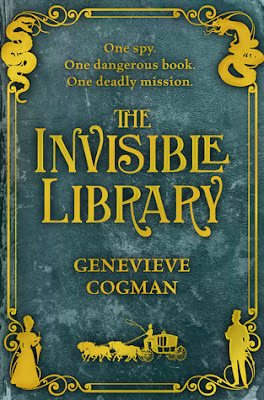 With a basic description like this, how can a reading junkie like me NOT read Genevieve Cogman's THE INVISIBLE LIBRARY?! And so I did with much anticipation and gusto. Only it didn't exactly had me enthralled. For all the great parts THE INVISIBLE LIBRARY has, there are also things about it that didn't quite work me. Let me start with the characters, Irene and Kai. Irene is a full-fledged Librarian whose has her share of missions already so she's seasoned. She's capable, discerning, and feisty to say the least. Kai is a bit mysterious, cocky, quite the chameleon, and his gorgeous charms might catch you off -guard. That said, there's an awkward pair-up going on here. It almost feels like GCogman is that annoying grandmother trying to match these two who don't have much chemistry, romantic tension, or even a flirtatious banter filled with double entendres and the like. One of the things that I love is how this world is set-up. Librarians can go back and forth and slide through time or universes depending on their mission a la Dr. Who. This is a great plot element in that it teases and fulfills every book lover's fantasy. Who doesn't want to be a superhero, and more specifically, the kind that "saves" unique and special book editions? I wouldn't necessarily classify THE INVISIBLE LIBRARY as strictly steampunk. For this mission they're in a version on London ridden with magic, fae, vampires, etc. There's some modern gadgets involved but it's not as rustic cool as your usual steampunk novel. Final verdict: THE INVISIBLE LIBRARY is not the best match for me. For all its awesome world elements, crisscrossing genres, and supernatural flavor, it failed to hold my attention. The current mystery about the missing book and all the brouhaha surrounding it is interesting, but I find the dialogue dry. And for all its inventive and fantastical props, the action adventure didn't do much for me. It's me, not this. Definitely. I love witty banter, like in Gail Carriger's books, so dialogue that falls kind of flat isn't quite my thing. You should keep going with the Parasol Protectorate! Me too! What's more entertaining than a snarky heroine and a quick-witted her right? I have seen this one around. It looks like one I'd read. Great review! This blurb did not grab me so I skipped this one. Didn't seem to miss out on too much. Do like the Doc Who parts though. I added this one to my TBR just last week after seeing it around, so I'm glad I saw your review. Nice to know, I'll go in with lower expectations now and see how it works. I'm cautiously optimistic although steampunk can be hit or miss for me. Thanks for the review! First I've herd of this one, sounds interesting. This one definitely sounds fascinating with the librarian as the main charcter, but sadly it sounds like it fell flat for you Braine! Thanks for the review on this one! Sorry it wasn't as enjoyable. I like the idea though, even if it's not a genre I like. Oh nooo! I have this for review but I don't want to read a book with sizzle-less romance. Boo! Ouch, there are few things that ruin a story like incompatible characters. The title sounds very promising and I like the idea of steampunk-ish elements and a library. It's too bad there were some parts that didn't quite work for you. It's a shame when the romance falls flat like that and there's no chemistry. I am not a fan of time travel, so I don't think I would enjoy that part as much. Great review! Oh boo! Sorry you didn't like it as much as did, Braine! I did listen to it, and the narrator is amazing, so that might have made a huge difference to my perception.